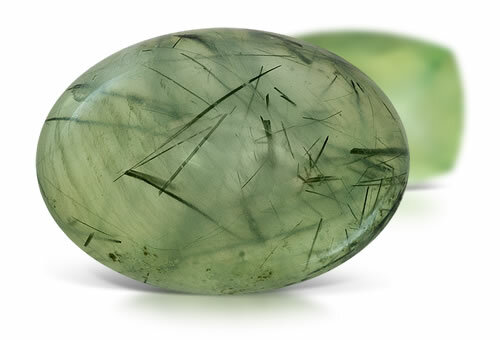 Prehnite is the first gemstone named for a person. It was named in honor of Colonel Hendrik Von Prehn, the Dutch mineralogist credited with its discovery in the 1700's in South Africa. Also, prehnite was the first mineral to be named and described from South Africa, long before the country became an important source for precious gems, including diamond. Many specimens of this gem have an interesting luminous quality, with a vitreous to mother-of-pearl luster. With color ranging from pale green to a pale yellowish green and a hardness of 6 - 6.5, Prehnite is considered to be fairly sturdy and long wearing when set in jewelry. RI, birefringence, and spectrum. Might have to use birefringence blink method. Prehnite can contain epidote and copper inclusions.